Here are the latest cards that I have made. 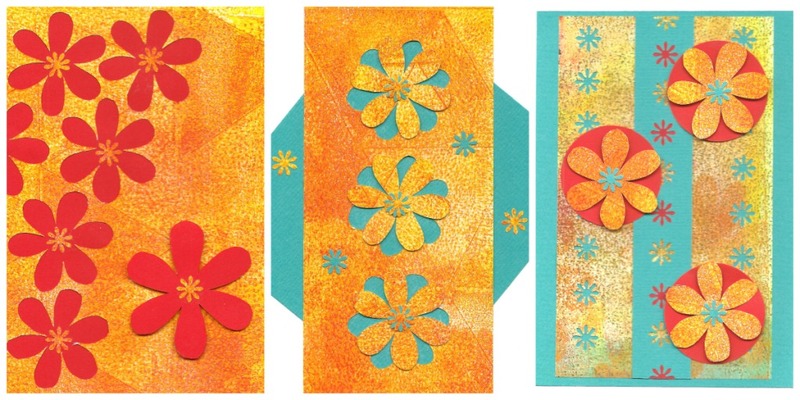 These three have all been made using my monoprints and cut-out flowers. I really like the colours I have used for these cards. I particularly like the one on the right-hand side, I like the way the red works with the teal. To make these I cut the larger flowers out by hand, I have made my own flower stencil that I draw around on the back of the monoprint, then I cut the flowers out using a scalpel. The smaller flowers are created using a paper punch. These are very lovely. I do love the colors you chose. Thank you Roberta, I have been braver with colours since using my Gelli Plate. I love it. Wow those are beautiful! I stopped by your blog after you left the comment on mine. Do you sell your cards online anywhere?